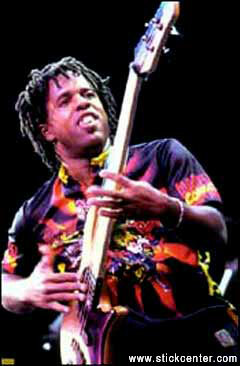 Victor Lemonte Wooten is one of the most celebrated electric bassists of all time. He is renowed by his incredible slap and tap technique on bass, but for his musicality overall. He plays with Bela Fleck and the Flecktons (winning 2 Grammy-award, one for his own as Best Instrumental Composition ), as well as with lots of different leading musicians all along the world. His technique is due to nobody as well as his feeling. Considered proffesional at 8. He is the only bass player to win the Bassist of the Year more than once on Bass Player Magazine, and named one of the Top 10 Bass Innovators of the ´90s. Down Beat voted him Talented Most Deserving Wider Recognition. Martin: Stickcenter is about tapping,so most of the questions will be about it, and your technique about it.... so first question could be: what is your approach to tap technique, how did you get into that technique and how you think about it? Victor:... tapping... there is a few different ways that it think about it. It is really about three ways that i think about it. One way is like Stanley Jordan or a piano player, playing one line with one hand and another line with the other hand just like a piano player, and for me Stanley Jordan is the best i´ve heard on a atringed instrument. I´ve never heard one that´s got together more than Stanley Jordan. Victor: .... yeah! and how you use that is up to you! You can use it in any styel of music. It can be latin, it can be flamenco... chord progressions could de jazz, rock, funk... whatever. But the technique can be used in any style of music. A technique doesn´t mean style. Technique is only technique. If i play the bass with my fingers it doesn´t mean that i´ve to play a certain style. If i play with my thumb it doesn´t mean i have to play funky music. If i play with a pick it doesn´t mean i have to play rock. The technique allows you to produce a note. What kind of note you produce, what style, is up to you, it´s not the technique. Martin: have you ever tried to play a stick? Victor: yes!.... i would probably play it "all fourths". Martin: It could be more logical coming from bass. Victor: Well... it is "more logical" whatever make sense to you! You know, a piano is logical and is not in fourths ( laughs) , so whatever works for you is logical... the way i see. For me is logical, because it is the way i´ve played my hole life, so the change would take me a while. You know, in string orchestra violins, violas and chelos are in fifths, so to them that´s logical... so it is whatever works for you. Martin: What is your opinion about stick future? Victor: As long as people makes good music it has future. The most important is the music you make from it. I think some people get into that instrument for the novelty, just because it´s like ....a fancy trick. You know, all is from the tap, and some people get into that and they can just do it but music is not that. To me is more important to make good music, if you make good music, it doesn´t matter what instrument do you play, what style... for me music is what is important. Music is important, that´s what´s more important. So i think the stick is a beautiful instrument for making great music. It really opens up the neck to be played like a piano. it´s just like a piano, and i think it has a good future as long as people makes good music. It has to do with the music that´s made. A lot of people, when they´re tapping, it sound like you tap.the sound is real thin, and you have that "tap tap tap" sound, so lot of people don´t like it. But it doesn´t have to sound like that, it really doesn´t! So again... i think it´s important to get a good sound, a good tone and make good music. Martin: Can you tell us somthing about your camp, your bass seminars? Victor: Yes! it´s six days, out in the woods and i have different bass teachers. Instructors like Steve Bailey, Adam Nitti, my brother Regi...and a lot of gests. But i mix it with "nature excercises" and study, so that we approach music and bass in a different way. Not jsut books, scales, theory... it´s a different way. It is designed to try to open up your mind a little bit, so that you see music in that way. Usually somewhere in the spring and then in the fall, maybe around. Martin: When was the first time you approached to tap technique and how? Victor: I don´t really remember, but it was probably early eighties or maybe late seventies, and just because my brother played piano and i have another brother that play saxophone. If you take a saxophone is like this (he puts his hands like playing an imaginary sax in the middle of the air) and if you turn it like this ( he turns his hands ´till reaching the position of an electric bass player) you get bass. So, i was able to see that and i get the techniques and tried to apply it to the bass or i would give him my bass and say" play it like it where your saxophone", "play it like a piano..." on my bass. So i was trying things but soon after that i heard a record of Stanley Jordan... someone gave me and i was amazed. So i started leaning Stanley Jordan´s songs. When i first heard Stanley Jordan i t was what really got me going with tapping. Slap technique was very early for me. i got it from my brother and listening to Larry Graham. I was trying to copy him. Martin: Can you tell us about your famous life philosophy, like working within nature and so....? Victor:Well... all of our ancestors... you know, our grandparents.... at soem point we where more conected to the earth. We knew about the plants, trees and we where very respectful of the Earth, and i think now we are going further and further form that. because of that i believe we are harming our resources. The air is dirty, you can´t drink the water, you have to take it in a bottle... that kind of things. For me learn more about it helps mo to understand more, so i´ve been practising. Learning about trees and plants, animals and how to live out of the land so that i don´t have to be stuck going to the store for food, getting a bottle for water.... so i like to respect, to undersand and learn from the Earth. Martin: Do you have any new solo projects? Victor: I have four solo recording out now and i´m working on a new one. 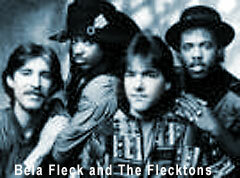 Also with the Bela Fleck and the Flecktons we are working on a new cd also. I´ve also been working on a cd with guitar player Greg Howard (note: the Jazz player). So those are the new projects i have now. There is also a new project with Steve Bailey, a new Bass-Extreme project is out with Denis Chambers on drums. There is also a book with a bunch of tunes from different recordings, maybe fourteen songs. Martin: Have you ever listened to stick players like Trey Gunn, Jim Lmapi, Guillermo Cides? Victor: I know some of them. Very good players! 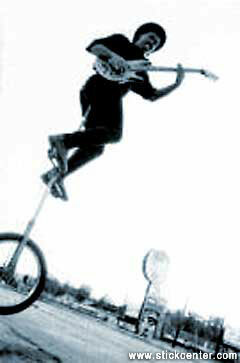 Michael Manring is one of the guys that does tapping and don´t pay attention to the tapping. You just hear beautiful music. That´s what i really love, i really love that! i mean... it´s just beautiful! it´s good music. Martin: Do you have any advices to the new tappers? Victor: Sure!.... for the new tappers i suggest to record themselves when they play so they can listen to it and decide whether it sounds good or not. Sometimes you pay too much attention, you only pay attention to the technique and you are not listening. You just want to know " how fast can i play", "how hard is it...".You know... but if we pay attention to the music first and the technique second, maybe there is an easier way to play that sound better. so just make sure it sounds good and a good way to do that is by recording yourselve playing and sit back and closing your eyes and listening. Then ask yourselve: does it sound good? I think that´s important, specially for tappers. Other thing i would add to tappers. I wrote an article one time that said that it would be better, or the way i like to think about tapping is, not tapping but pressing. Because most of the times people taps the notes and that´s exactly what it sounds like "tap tap tap", like a tap-writer. but if you press it and hold it down and you really get your finger on it, it gives a bigger sound andthen you get more leggato, beautiful music, by holding the notes down. Just a little longer rather than "tap tap tap", you know. So i think about pressing the notes not tapping the notes. Martin: Do you set up specially your bass for tapping? Victor: I have my strings close to the neck. I have a set up for playing with my fingers and my thumb and then i make sure i can tap also, but my basses are very easy to play the strings are pretty light: 40 on my g-string 55, 75 and 95. Quite light and very easy to play. But nothing different from bass just to tap. Four-string (bass) is what i´m confortable with. i grew up with that. With the Fleckones i play a 5-string fretless a lot, but tonight only a four string fretted. But i have six string eight string... i have a buch of different basses. I like four string, i where i am most confortable. Victor: No.... i really said my thought about tapping which is really make it musical. You got lessons on my web site if you like. Thanks for all and good luke to all the new tappers! 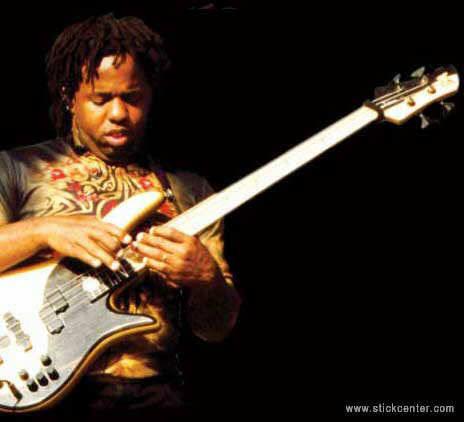 Victor Lemonte Wooten es uno de los más renombrados bajistas eléctrico de todos los tiempos. Es reconocido por su increíble técnica de slap y tapping en el bajo, pero sobre todo por su musicalidad. Toca con Bela Fleck y lo Flecktons( ganando dos Grammy-award, uno de ellos por una de sus composiciones como "Best Instrumental Composition"), así como con muchos de lo mayores músicos de todo el mundo. Su técnica no tiene rival al igual que su musicalidad. Profesional a los ocho años. Es el único bajista en ganar en premio de "Bajista del año" más de una vez en " Bass Player Magazine" y ha sido nombrado uno de lo diez bajistas más innovadores de los noventas. Down Beat lo ha votado como "el músico con más talento que se merece mayor el mayor reconocimiento posible" en una de sus encuestas. Martçn: StickCenter está dedicado a la técnica del "tapping", por lo tanto la mayoría de las preguntas girarán en torno a ello, y tu técnica al respecto....por lo que la prime ra pregunta sería: ¿cual es tu visión acerca de esta técnica, como la descubriste y te metiste en ella, y como piensas cuando tocas de esta forma? Victor: ... "tapping"... hay varias formas distintas de pensar acerca de él. Una forma es la de Stanley Jordan, tocar una línea con una mano y otra distinta con la otra, exáctamente como lo haría un pianista. Para mí Stanley Jordan es el mejor que he escuchado haciendo esto en un intrumento de cuerda. Nunca he escuchado a nadie que haya logrado juntar tanto como Stanley Jordan. Victor: ... ¡Exáctamente! ¡y lo como lo uses depende de ti! Puedes usarlo para cualquier estilo de música. Puedes tocar latino, flamenco... las progresiones de acordes pueden ser tanto de jazz como te rock, funk... ¡todo lo que tú quieras! Toda técnica es utilizable en cualquier estilo de música. La técnica no significa ningún estilo concreto. La técnica es solo técnica. Si yo toco el bajo con mis dedos no significa que tenga que tocar determinado estilo de música. Si toco con mi pulgar no significa que tenga que tocar música funk. Si toco con una púa no significa que tenga que tocar rock. La técnica te permite producir una nota. Qué tipo de nota produzcas, o qué estilo, depende de ti, no de la técnica. Martçn: ¿Alguna vez has tratado de tocar un stick? Victor: ¡Por supuesto!... Yo probablemente escogería una afinación por cuartas. Martçn: Resulta más lógico para un bajista. Victor: Bueno ... ¡es "más lógico" cualquier cosa que tenga sentido para ti! Sabes, un piano es lógico y no está afinado en cuartas (risas), por lo tanto cualquier cosa que funcione, que tenga sentido para ti, es lógico. Para mí es lógico, porque esa es la forma en la que he tocado toda mi vida, y cambiarla me llevaría un tiempo. Por ejemplo, en una orquesta de cuerda los violines, violas y chelos están afinados por quintas y para ellos es lógico... Por lo tanto "lógico" es todo lo que funcione para ti. Martçn: ¿Cual es tu opinión acerca del futuro del stick? Victor: Mientras la gente haga buena música tendrá futuro. lo más importante es la música que tu hagas con él. Creo que mucha gente se mete en este instrumento por la novedad, por que es algo como... un truco curioso, una moda. Sabes, todo parte del "tap" y la gente se mete en ello porque pueden hacerlo, pero la música no es eso. Para mí es má importante hacer buena música. Si tu haces buena música no importa que instrumento toques ni en que estilo... para mí la música es lo importante. La música es lo que importa, y eso es lo más importante. Por lo tanto, yo creo que el stick es un instrumento muy bello para hacer muy buena música. Realmente de abre todo el diapasón para ser tocar como un piano. Es igual que un piano y creo que tiene un buen futuro siempre y cuando la gente haga buena música. Todo tiene que ver con la música que se haga. A la mayoría de la gente, cuando ellos "tapean" suena como si estuvieses golpeando ( tap= golpear, pulsar). El sonido es muy fino y delgado, y tienes ese sonido "tap tap tap", por lo que al público no le suele gustar. Pero no tiene que sonar de esa forma ¡Realmente no tiene por qué! Una vez más... creo que es importante conseguir un buen sonido, un buen tono y hacer buena música. Martçn: ¿Puedes contarnos algo de tu campamento y de tus seminarios de bajo? Victor: ¡Claro! Duran unos seis días en medio del bosque y tengo a varios profesores de bajo. Profesores como Steve Bailey, Adam Nitti, mi hermano Regi.. y un montón de invitados. Pero yo mezclo esto con "ejercicios con la naturaleza" y estudio, por lo que nos acercamos a la música y al bajo desde un punto de vista distinto. No solo libros, escalas, teoría... es una prespectiva distinta. Está diseñado para abrir tu forma de pensar un poco, para poder ver la música de otra forma. Normalmente se realiza en algún momento de la primavera y del otoño, más o menos. Martçn: ¿Cuándo fue la primera vez que te acercaste a la técnica del tapping y cómo? Victor: Realmente ni me acuerdo, pero fue alrededor de principo de los ochenta o tal vez a finales de los setenta. Mi hermano tocaba el piano y tengo otro hermano que tocaba el saxofón. Si cojes el saxo tus manos están de esta forma ( pones sus manos como si sostuviera un saxo imaginario) y si lo giras de esta forma ( gira las manos en el aire con al misma postura hasta que se queda en la postura en la que se tocaría un bajo ) tienes un bajo. Yo fui capaz de ver esto y traté de absorver sus técnicas y traté de aplicarlas al bajo. Les daba mi bajo y les decía " tócalo como si fuera tu saxofón" o "tócalo como si fuera un piano"... Estaba experimentando cosas cuando escuché un disco de Stanley Jordan; alguién me lo prestó y me sobrecojió. Empecé a aprenderme los temas de Stanley Jordan. Cuando lo escuché por primera vez fue cuando realmente comencé a trabajar con el tapping. La técnica del Slap vino mucho antes. Lo aprendí de mi hermano y de escuchar a Larry Graham. Intentaba copiarlo. Martçn: ¿Puedes contarnos algo de tu filosofía de vida y tu trabajo con la naturaleza...? Victor: Bien... todos nuestros antepasados... nuestros abuelos... en algún momento ellos estaban muy conectados con al Tierra. Conocíamos las plantas , los arboles... y le teníamos mucho respeto a la Tierra y cada vez nos hemos alejado más y más. Por eso creo que estamos agotando nuestros recursos. el aire está sucio, no puedes beber el agua, tienes que beberla de una botella.. ese tipo de cosas. Para mí, aprender más acerca de ellos me ayuda a comprenderlo, y he estado practicando. Aprender sobre árboles y plantas, animales y como vivir de la tierra de forma que no tengas que ir a la tienda a por comida, ni sacar el agua de una botella... Me gusta respetar, comprender y aprender de la Tierra. Martçn: ¿Tienes algún nuevo proyecto en solitario? Victor: Tengo cuatro cds en solitario en este momento y estoy trabajando en uno nuevo. También estamos trabajando en un nuevo cd con Bela Fleck y los Flecktons. También estoy trabajando en un cd con el guitarrista Greg Howard (Nota: el Jazz player). Esos son más o menos los proyectos en los que estoy trabajando. Hay otro aún más con Steve Bailey , una nueva edición de los "Bass-Extreme", con Denis Chambers a la batería. También trabajo en un libro con un montón de transcripciones de los cuatro discos en solitario, tal vez catorce temas. Martçn: Alguna vez has escuchado algún otro stickista como Trey Gunn, Jim Lampi o Guillermo Cides? Victor: Conozco a algunos de ellos. ¡Son grandes músicos! Conozco a Michael Manring. es uno de esos tipos que hace tapping y no prestas atención al tapping . Solo escuchas música bella. Eso es lo que me encanta ¡Me gusta de verdad! Quiero decir.... ¡Es música bonita! Es buena música. Martçn: ¿Podrías darnos algún consejo para nos nuevos "tapeadores"? Victor: ¡Por supuesto! Para los nuevos "tapeadores" les recomiendo grabarse a si mismos cuando tocan para que puedan escucharse y puedan decidir si suenan bien o no. Normalmente prestas demasiada atención a lo que tocas, solo prestas atención a la técnica y no escuchas realmente. Solo quieres saber "cuánto de rápido puedo tocar", " qué dificultad tiene esto que toco...". Pero si prestamos atención a la música primero y a la técnica después , tal vez descubramos una forma más facil de tocar que suena mejor. Por lo tanto asegúrate de que suena bien y una buena forma de hacerlo es grabándose y después sentarte y cerrar los ojos para escuchar. Entonces pregúntate: ¿Suena bien? Creo que es muy importante, sobre todo para los tapeadores. Me gustaría añadir un consejo más para los tapeadores. Hace tiempo escribí un artículo que decía que es mejor, o al menos prefiero pensar de esa forma, presionando las cuerdas, no golpeandola ( to tap= golpear ). La mayoría de las veces la gente golpéan las notas y eso es por lo que suena "tap tap tap", como si fuera una máquina de escribir. Pero si presionas las notas y las mantienes abajo y realmente implicas a tus dedos en ello y sientes las notas vibrando en los dedos, esto te dá un sonido mucho más grande y mucho más leggato, música más bella, manteniendo pulsadas las cuerdas. Simplemente presionar un poco más que el "tap tap tap" de una máquina de escribir. Por lo tanto prefiero pensar en presionar las notas, no en golpearlas. Martín: ¿Empleas un set-up (ajuste de las cuerdas )distinto para tocar tapping en tu bajo? Victor:Tengo las cuerdas muy cerca del diapasón. Tengo un ajuste para tocar con mis dedos y el slap con mi pulgar y entonces me aseguro de que puedo hacer tapping también. Mis bajos son muy fáciles de tocar y pongo cuerdas de un calibre muy bajo: 40 para la cuerda sol, 55, 75 y 95. Myy suave y muy facil de tocar. Pero no ajusto mi bajo específicamente para tocar tapping. El bajo de cuatro cuerdas es lo más cómodo para mí. Me críe y crecí con él. Con los Flecktons toco también un bajo de 5 cuerdas sin traste frecuentemente, aunque esta noche solo voy a tocar con un bajo de cuatro cuerdas con trastes. Pero tengo uno de seis cuerdas, otro de ocho... tengo un montón de bajos . Me gusta el de cuatro cuerdas, es donde estoy más cómodo. Martçn: ¿ Quieres añadir unas últimas palabras? Victor: No... realmente he dicho todo lo que pienso acerca del tapping, esto es, hacerlo musical. Si queréis tenéis lecciones en mi página web. ¡¡¡Gracias por todo y muy buena suerte a todos los nuevos tapeadores!!! 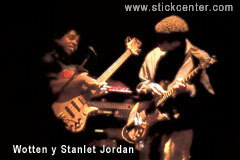 The Stick Center agradece a Victor Wooten por su colaboración para esta entrevista.